The 2016 Tour de France starts today, as does the IAAH heraldic Tour de France. This year the grand départ is in France (it is often abroad), to be accurate, off the coast of France on Mont-St-Michel, arguably the most stunningly photogenic commune in all of France. Français : d'azur aux deux fasces ondées de sinople et brochant sur le tout, à deux saumons d'argent posés en barre, rangés en pal, celui du chef contourné. Blazon: Français : D'azur à l'église d'argent, couverte d'or et surmontée de deux parachutes aussi d'argent soutenant chacun une étoile du même, l'église chargée des lettres A et M capitales de sable, à la champagne cousue de gueules chargée d'un léopard aussi d'or. Blazon: Azure, in pale a drakkar and sword argent (the sail charged with a leopard gules), between 2 gussets Or each charged with a fleur de lys gules. Chris Green wrote: The 2016 Tour de France starts today, as does the IAAH heraldic Tour de France. The motto "H-minus" refers to the convention by which the hour at which a military operation is to begin is designated "H-hour." Time after H-hour is identified as "H+1," "H+2," and so on. "H-minus" proclaims that the regiment goes into action before H-hour. Joseph: As the sole originator of the cycle tour threads, as well as being the moderator, I accept any heraldic-related item that has to do with the event in question. Thus I try to provide at least a couple of illustrations of arms that relate to the day's route. They may be cities, towns, regions, historical people associated with the area, or, as in this case, historical events. The 505th certainly meet the criteria. It would be interesting to have the blazon. And what is the crest? Shield - Argent, four bendlets Azure surmounted by a winged Black panther salient inverted Proper, that part on the bendlets fimbriated of the first. Crest - From a wreath Argent and Azure, a winged arrowhead point down Gules, in front of a cloud Proper. Shield - Blue and white are used for Infantry. The black panther symbolizes stealth, speed and courage, all characteristics of a good parachutist. The wings are added to represent entry into combat via air, and the bendlets symbolize the unit's parachute drops into combat. Crest - The winged red arrowhead is used to represent the regiment's first combat attack in Sicily during World War II. 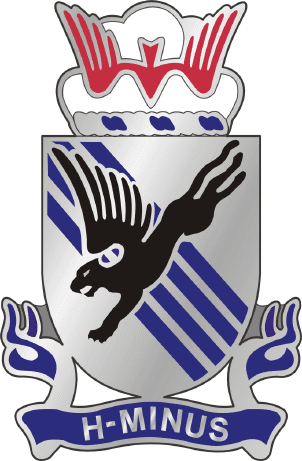 The coat of arms was originally approved for the 505th Airborne Infantry Regiment on 24 January 1952. It was redesignated for the 505th Infantry Regiment on 20 May 1958. So this is not the coat of arms as it existed at the time of the Normandy invasion. According to a regimental history website, the arms as designed by the men of the regiment was the following, but the Heraldic Services Branch (predecessor of the Institute of Heraldry) insisted on modifications. It's not clear whether this simple depiction of a panther was adopted during or after the war. Blazon: English: Azure, in fess three columns argent, and on a chief gules, a leopard Or armed and langued azure. Francais: D'azur à trois colonnes d'argent rangées en fasce, au chef de gueules portant un léopard d'or. Why three Ionic columns I have no idea. Coutances Cathedral is gothic. Blazon: English: Azure, on a fess argent, charged of three mullets of six points sable, accompanied of three bezants (Or), two in chief, one in point. Francais: d'azur à la fasce d'argent chargée de trois étoiles de six rais de sable, accompagnée de trois besants d'or. The logo designer had obviously never heard a seagull. Monday's stage takes the Tour from Granville on the coast to Angers in the Département of Maine-et-Loire and former capital of the province of Anjou. Français : D'azur au dextrochère d'or mouvant du flanc d'une nuée du même, lequel tient une épée d'argent, garnie aussi d'or, surmontée d'un soleil rayonnant du même. Would anyone care to try the English version? Anjou was the birthplace of Henry "Curtmantle", son of Count Geoffrey of Anjou and Matilda (daughter of King Henry I of England) who became King Henry II of England, the first of the Angevin (the adjective derived from Anjou) or Plantagenet line. Français : coupé d'azur et de gueules, à une fasce d'argent maçonnée de sable et crénelée de deux créneaux du même, brochant sur la partition, accompagnée en chef de trois fleurs de lys d'or rangées, et en pointe de la lettre S, aussi d'or. The finish line is in Limoges in the Département of Haute-Vienne. The arms of the city depict a bust of St Martial, who evangelised the area around AD250. The need to identify the saint by adding the letters S and M will be queried by those who find the use of letters of the alphabet in heraldry unwelcome. The use of the azure chief with two or three fleurs-de-lis, supposedly to indicate the importance of the city, is irritatingly repetitive. Blazon: English: Gules a bust of Saint Martial proper clothed and nimbed or between the antique letters S and M of the same, on a chief azure three fleurs de lis or. Français : De gueules, au chef de Saint Martial de carnation, orné à l'antique d'or, ombré de sable, entre deux lettres gothiques d'or S et M; au chef d'azur, chargé de trois fleurs de lis d'or. Blazon: English: Ermine a Bordure Gules overall a Fess undy Azure. Français : D’hermine à la bordure de gueules, à la fasce ondée d’azur brochant sur le tout. Blazon: English: Vert two bendlets Or. Français : De sinople aux deux bandes d’or. Blazon: English: Or a Gonfanon Gules fringed Vert. Francais: D’or au gonfanon de gueules frangé de sinople. Blazon: English: Or a Gonfanon Gules fringed Vert, on an Inescutcheon Azure a Bend Or between six Escallops Argent. Francais: D’or au gonfanon de gueules frangé de sinople, sur le tout d’azur à la bande d’or accompagnée de six coquilles d’argent. Blazon: English: Per Pale Azure and Or semé of Fleurs-de-Lis counterchanged, a Bordure engrailed Gules. Francais: Parti d'azur et d'or semé de fleurs de lys de l'un en l'autre, à la bordure engrêlée de gueules. The French blazon is: D'azur aux trois fasces d'argent, maçonnées de sable, la première crénelée de cinq pièces, la deuxième crénelée de quatre pièces, la troisième crénelée de trois pièces et ouverte du champ. Today's homework is to provide an accurate English blazon. Le Lioran is in fact in the Commune of Laveissiere, which sadly seems to have no arms of its own. What a let-down! The blazon that accompanies this illustration gives the escallops as being in orle. But I have my doubts as to whether six of anything can form an orle, which must surely encircle the whole shield. Blazon: Français: D’azur à la bande d’or accompagnée de six coquilles du même ordonnées en orle. English: Blazon: Azure a bend between six escallopes in orle all Or. Blazon: English: gules a willow tree couped in chief with six leafless branches or a chief azure three fleurs de lis or. Français : de gueules au saule d'or étêté, ayant six branches sans feuilles, trois à dextre, trois à senestre ; au chef cousu d'azur chargé de trois fleurs de lis d'or. Blazon: Engloish: Gules a Cross of Toulouse Or. Francais: De gueules à la croix cléchée, vidée et pommetée de douze pièces d'or. Whether the new super-region of Languedoc-Roussillon-Midi-Pyrénées will use the same arms, which seems logical since it covers most of the historical Languedoc, is a matter of conjecture.